This Easy Chicken Quinoa Bowl is simple, hearty, and packed with flavor as well as protein. It makes a perfect weeknight dinner or workaday lunch. My eldest became a college man this year. About three weeks before classes started, he secured an on-campus job and got into the routine of daily trips to campus. Even better, health nut that he is, he started prepping lots of food throughout the week to take for his meals away from home. Could we call it divine payback that my husband and I benefited from this arrangement? Yes, I know I got a double blessing to have a teenage son who asks, “When are you going to the store for more vegetables?” The kid is a weight-lifting, body-building kind of guy and has learned that veggies do a body good. So, batches of roasted vegetables, quinoa, and chicken ready and waiting in the fridge for when I’m hungry? Sign me up! I’ll happily throw some more broccoli and carrots in my cart! One of the protein-packed, healthy lunches that he’s prepared has been the ever so easy Quinoa Bowl. It’s like a rice bowl, but without the typical Mexican/Asian food flair. We’ve been using this tri-color quinoa* if you’re wondering about the color. It’s a great source of protein and a nice change from rice for a gluten-free grain, even though it’s a pseudo-cereal instead of a true grain. Quinoa is complicated. FishBoy likes his quinoa bowl heated, while I prefer it cold with Dijon vinaigrette. It’s amazing topped with a little chopped avocado. You can vary the seasonings and the vegetables to suit your tastes. This is how we like to make it. Er, well, how I like him to make it. Prepare the roasted vegetables according to recipe directions. Pictured are mushrooms, potatoes, sweet potatoes, garlic, and carrots. In a large skillet, heat the oil until shimmering. Add the chicken pieces and the seasoning. Cook, turning, until the chicken is tender and cooked through. Remove the chicken from the heat. When it is cool enough to handle, chop the chicken into bite-sized pieces. 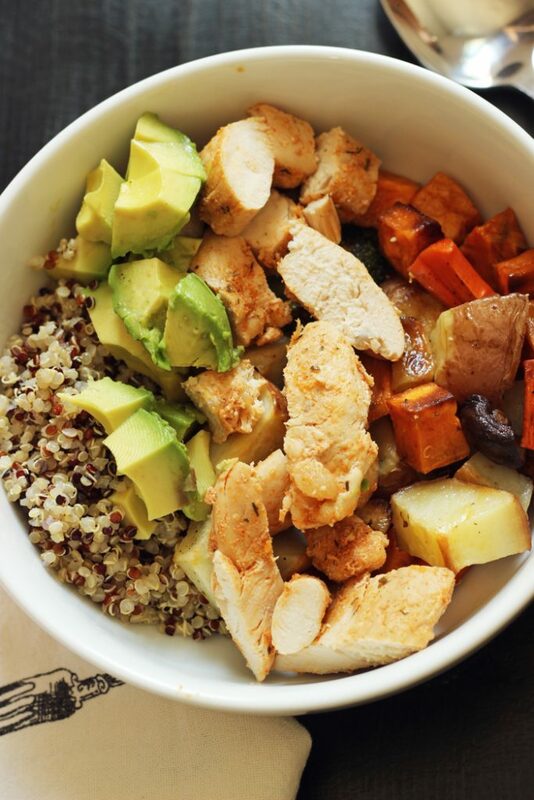 Assemble the bowls with vegetables, quinoa, and chicken. Serve hot, cold, or room tempertature. Top with chopped avocado and vinaigrette if you like. Perfect for those of us who are watching our blood sugar – thanks! Yes, the chicken and quinoa hold up; the vegetables have varied results, based on their type.